I do have quite a bit more free time than I used to. My life feels more balanced even if I still don’t have enough time to do everything I want. For me, this was not always the case. Less than a year ago, I worked 50+ hour weeks, commuted 45-55 minutes each way, volunteered on a board of a nonprofit organization (and became the vice-chair), was part of a book club, started a blog, tried to exercise regularly and cook healthy meals, and invested time in building relationships with family and friends. I felt constantly frazzled. My to-do list was pulling me in so many different directions that I was constantly thinking about the things I wasn’t getting done, even while doing things I enjoyed. Not only was I working long hours, but I was also managing complex interpersonal relationships. I was constantly thinking about how to maintain relationships, stay true to myself, and keep my livelihood. We all respond to prolonged stress in slightly different ways. For me, my mental health broke down slowly until it became a crisis. Severe anxiety and panic attacks forced me to take several months off of work. During this time, I had an opportunity to really understand my motivations and what drove this level of busyness in my life. I was also able to figure out some things that I could do to combat these feelings of busyness. During the great depression, the economist John Maynard Keynes predicted that because of technological innovation, that within the next 100 years (by 2030), people would only need to work 15 hours/week. The economists weren’t entirely wrong about their predictions. The overall average work hours have decreased in industrialized countries. In the United States, total work hours have decreased by about 10%. However, this statistic doesn’t tell the whole story. 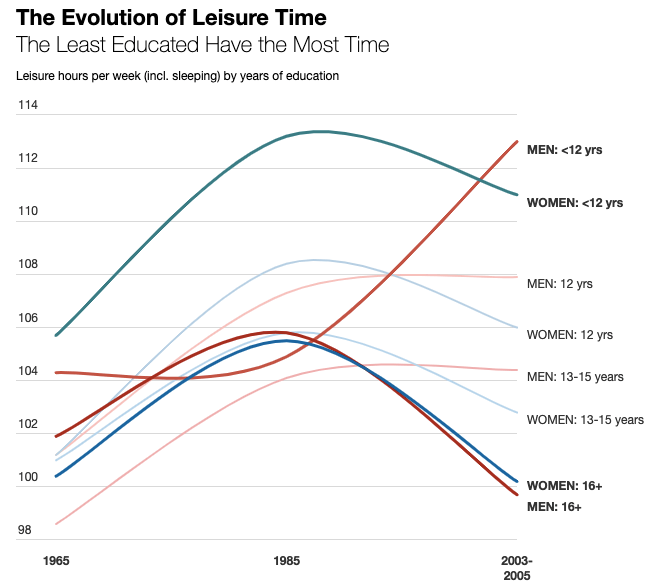 Highly educated people have actually seen their leisure time decrease in the last 50 years. Not only are college educated people in the United States working more, but we are also doing more outside of work than ever before. According to Brigid Schulte, in her book “Overwhelm: Work, Love, and Play, When No One Has the Time,” our busyness goes beyond work. In our lives, we’re constantly “toggling between work, family, housework, and other obligations,” and we constantly feel behind on everything. There are many reasons why we feel like we need to stay busy. 1. Busyness signals value and social status. Without realizing it, we often buy into the cultural narrative that busy equals success, importance, and value. When we do, being and feeling busy makes us feel ambitious. It makes us feel important, valued, and worthy. When we buy into this cultural narrative, the opposite also feels true. We can become insecure about our idle time. 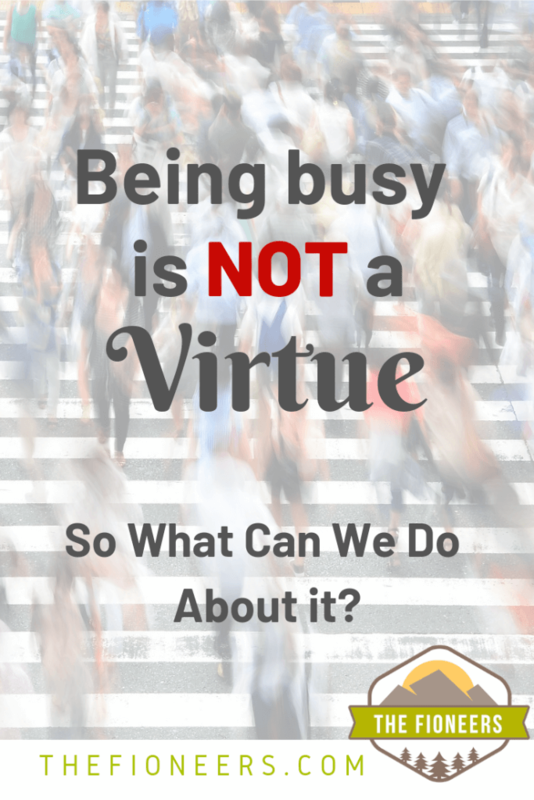 If we aren’t busy, does it mean that our lives are meaningless? That we are lonely? Not successful? Uncool? Busyness can also be a “hedge against emptiness.” If our calendars are completely full, if we are in demand every hour of every day, obviously our lives can’t be meaningless or trivial. Right? 2. There is social pressure to conform to the culture of busyness. The value of being busy is so ingrained in our culture that we often perpetuate this norm through daily interactions without even realizing it. Going back to the example above about how I work part-time, and people are baffled. I do have reasons for working part-time. I want more balance to keep myself mentally healthy and to have time for creative outlets (like blogging). However, I don’t talk about my mental health or my blog with people in everyday life. 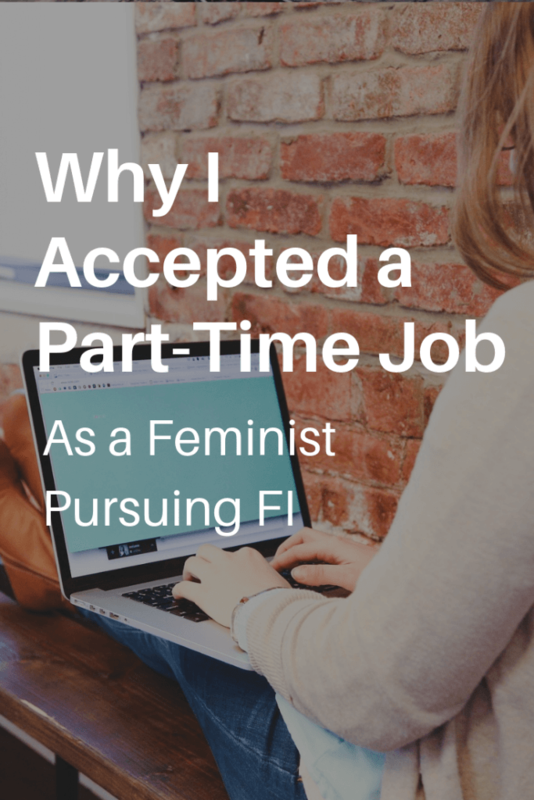 When it’s hard for people to accept that I work part-time, I feel pressure to explain more about why when I shouldn’t need to. 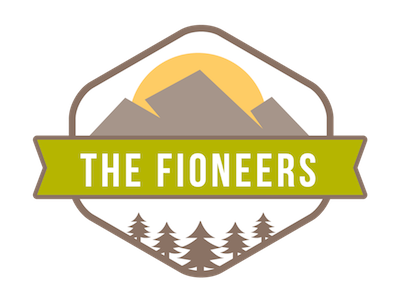 It seems like a lot of others in the personal finance space have experienced similar things. It’s definitely pervasive in my office. Unless you have an “excuse” (e.g. kids, appointment, dog) you’re expected to work late. People who have excuses can walk out at 5 PM with no judgment. God forbid any of us semi-young people try to leave early without an acceptable reason! It’s interesting, in my role people constantly apologize for asking me things.. Starting with “Sorry, I know you’re really busy…” And then are grateful that I will always stop and make time. It’s a weird external pressure.. Like if I don’t feel crazy busy I’m slacking. It’s like we have to one-up each other in misery. I don’t play the game anymore, I don’t want to contribute to the glorification of busy. We all have the tools and time and decision making ability to be less busy and prioritize ourselves. I’m taking 10 weeks off work soon to be with my daughter who is due to be born any day now. Even with this reason, I still sense the need to qualify my time off with: “It’s to be with my family and help my wife. It’s not a break”. There is still judgement in non-work busyness. That’s what took me way too long to start working out at the office gym when I was done for the day – since I’m PT I’m off before everyone else and it made me feel like I just needed to go pick up the kid because that’s “why” I’m working less. As you can see, even some of the most countercultural people I know in the personal finance community feel the external pressures to conform to the culture of busyness. We sometimes still feel like we need good reasons to not be busy. I have certainly fallen victim to this. When I was first considering Financial Independence, I was intrigued by the question, “What would you do if you didn’t need to work for money?” I hadn’t thought about what I actually wanted to do in many years. It was too painful to admit I wasn’t living the life I wanted to be living. In order to understand the pain, move on, and figure out what I really wanted, I needed to step out of the crazy-busyness. This has also been a theme within the FI community. Many people have been clear that reaching Financial Independence doesn’t fix your problems. It exposes them for two reasons: 1) you no longer have money as an excuse, 2) you have a lot more time for your problems to catch up with you. Being too busy impacts two main things in our lives – our health and our relationships. When we are busy, overwhelmed, and stressed our brain perceives a physical or psychological threat, triggering adrenaline and our fight or flight response. While the threats we experience now are much less dangerous than our ancient ancestors, our bodies and brains can’t tell the difference. When we experience prolonged stress, it goes beyond the fight or flight response. When the stress continues, our immune system kicks into overdrive to help prevent illness and infection. Because our bodies can’t sustain this overdrive for long, it leads to exhaustion – the body burns out – and larger health issues can arise. Because everyone is different, people can experience different physical or mental health issues as a result of prolonged stress. Some might experience headaches, depression, anxiety, ulcers, insomnia, or worse – cancer, heart attack, or death. One simple example of this from my life comes from college. Every year around exams, I’d push myself to the brink of exhaustion studying. Then once the exams were finished, I would immediately get sick either with a cold, the flu, or a stomach virus for the first 1-2 weeks of the holiday break. My immune system was working in overdrive, and when it no longer needed to, it was depleted and couldn’t keep me healthy. Another example is from my last job. As I have shared, I experienced prolonged stress and long hours in my last job. The stress was slowly building for a long time and then there was an extremely stressful event that pushed me over the edge. I began to have panic attacks that took several months to get under control. One of the biggest complaints that people have about being too busy is that they feel guilty about not spending time with the people who are important to them. I recently read an article by someone who has worked in hospice for 6 years. 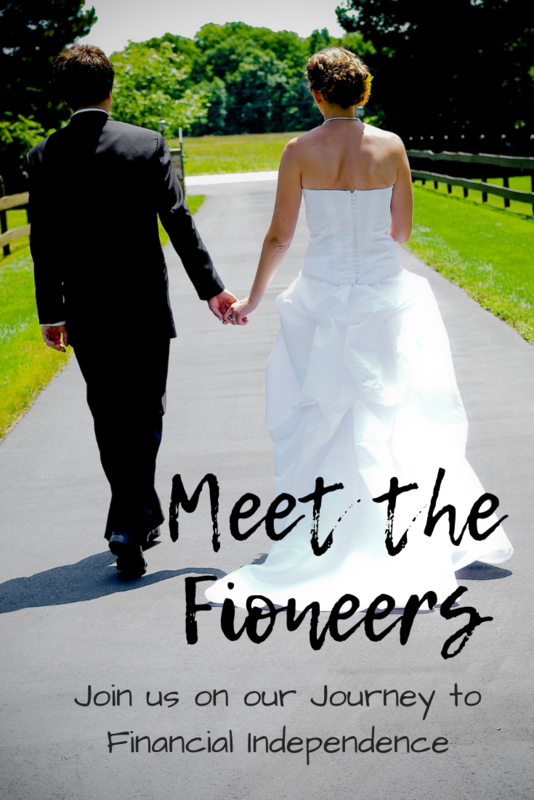 She wrote about the common regrets that people have at the end of their lives. Within the top three, we find that people wished they had spent less time working, more time loving the people who mattered to them most and being a better spouse, parent, or child. While it’s clear that busyness can have consequences, I am not trying to suggest that we should avoid any and all activities. Nor am I necessarily suggesting that some busyness is a bad thing. 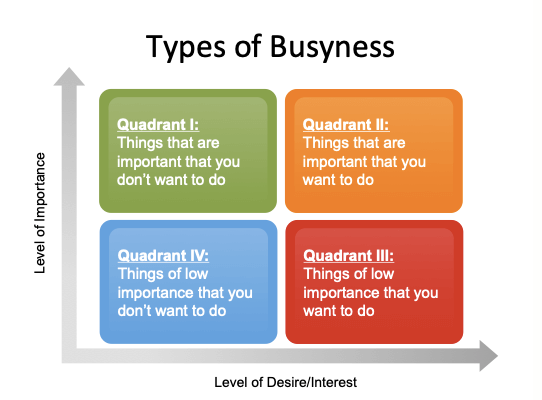 We likely want to be spending the majority of time on things in Quadrant II and III and the least time on things in Quadrant IV (things that aren’t important to us that we don’t want to do). Only you can decide which things fall into various quadrants depending on how important they are to you and your own interests. Here’s a sneak peek at my own busyness matrix. What are the ramifications if this doesn’t get done? If it’s important, does it need to get done by me? There are a few things I’d love to explain regarding my priority chart. I do actually enjoy my part-time job, which is why I have it in Quadrant II. I do not believe I need to work extra hours nor do I want to. This is why working extra hours falls in Quadrant IV. 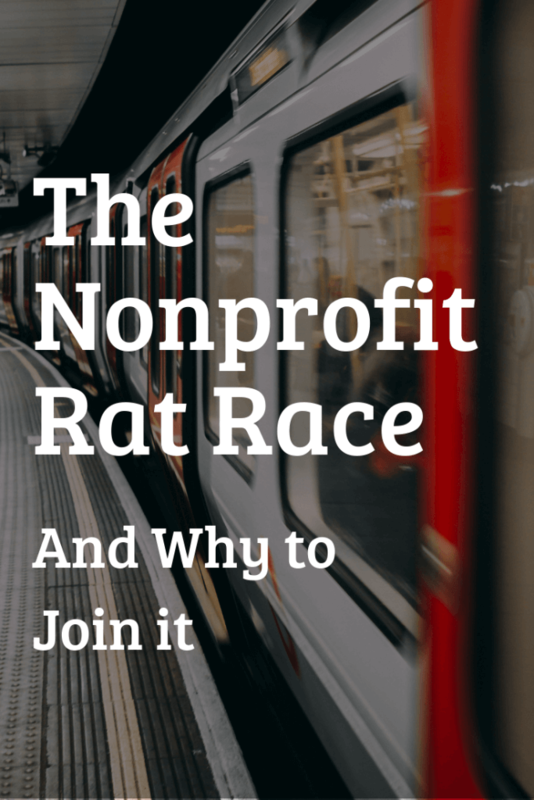 I used to serve as a board member of a nonprofit. To be clear, I do believe that the mission of the organization is important, which is why I struggled with the decision to quit. When I was feeling overwhelmed, I asked myself the question, “Does it need to get done by me?” I realized the answer was “no.” If I stepped down, I knew someone else would step up. Because I have a very strong group of friends in my life, I want to prioritize my energy by spending time with my closest friends. I currently have “acquaintances” in Quadrant IV because I don’t feel like I’m in a stage of life where I need to make a lot of new friends. If things change and I want to make new friends, spending time with acquaintances would become a higher priority. I struggled with whether to put blogging, photography, and travel into the low or high importance bucket. Ultimately, although I greatly enjoy these things, the ramifications if they don’t get done are quite low. I put them into Quadrant III because everything can’t be a high importance priority. I do still want to ensure that I make time for these things in my life because these things bring me joy. It’s not surprising that the solutions to busyness are different depending on the type of busyness we experience. Here’s a framework I put together based on personal experience, conversations with others, and a variety of resources. If something is of high importance, but I don’t want to do it (e.g. cleaning, meal prep, exercise, etc. ), I will think about ways to make it more efficient or more pleasant. For example, when I was cleaning the house to prep for a visit from family, I listened to a podcast that I wanted to listen to. 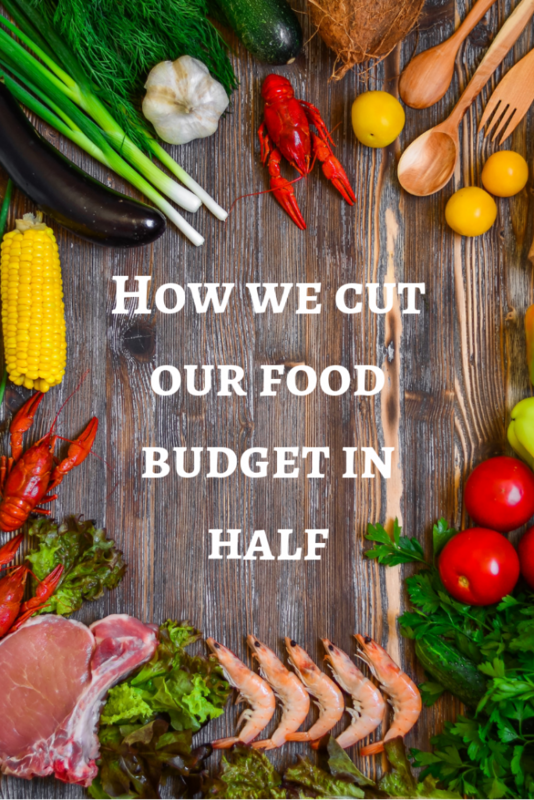 I don’t love to cook, but I feel that it’s important to save money by not eating out or ordering in. To be more efficient, I try to cook meals that are relatively easy and can provide leftovers for multiple additional nights. These can sometimes be the hardest ones of all because these are the things that feel very important to us and we want to do them. These typically aren’t things that we can deprioritize nor do we want to. If we are busy with these things, the main focus should be to cope and become more efficient where possible. Focusing on self-care is important. I heard from various people in our Twitter discussion about busyness that getting off the grid through camping or a long bike ride are important ways of coping with busyness. Another strategy is to be fully present in the moment. According to researchers at Johns Hopkins, when we are not fully present and are instead focusing on what else we should be doing, it makes us feel busy, even if we aren’t. If we are mindfully present with the things that we enjoy, we won’t feel as busy doing them. She gave up on perfectionism. She realized she doesn’t need to be the perfect mother/worker/housekeeper/daughter. She’s learned her own natural rhythms and now prioritizes her days around them. Since she is most alert in the morning, she tackles her most important tasks then. Finally, it’s important to re-examine our own priorities often. Sometimes, we are still behaving as if something is of high importance, but on further examination, it isn’t. That’s okay and important to learn so that we can deprioritize it. These are going to be the hardest things to say no to. 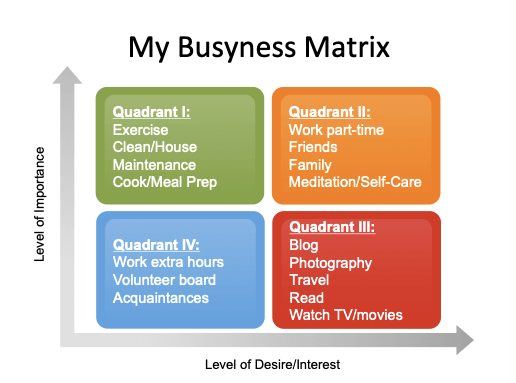 One strategy to focus on here is to determine which things on your Quadrant III list bring you the most joy and focus on those. 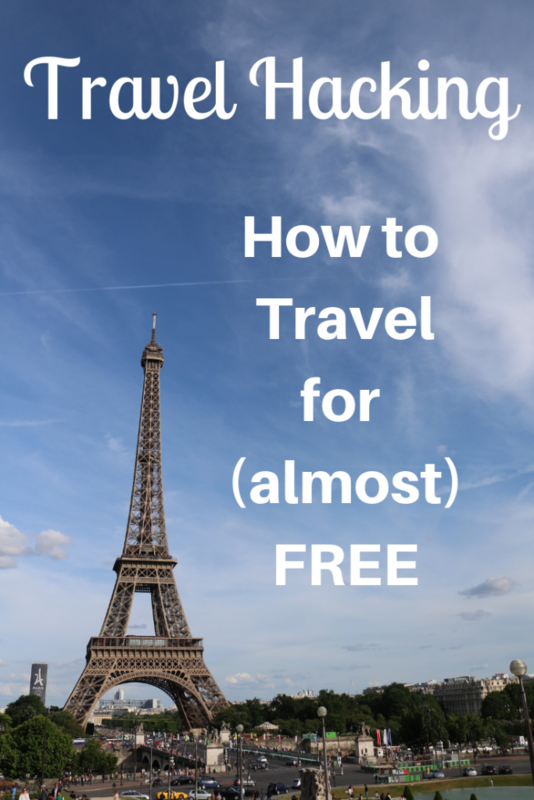 For me, it’s important for me to prioritize blogging and travel. 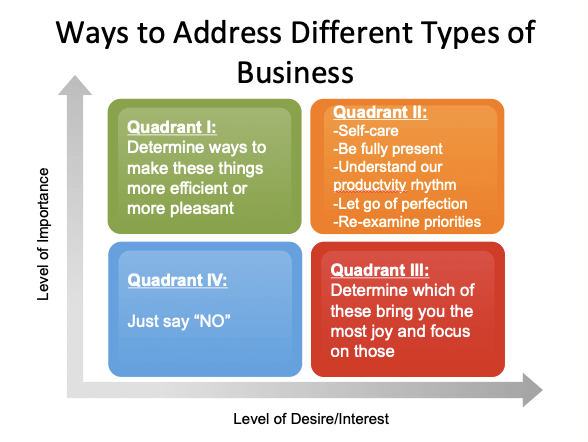 Also, hopefully by focusing on saying no or becoming more efficient in the other quadrants, we can make more time for Quadrant III things. Recently, I’ve had former colleagues reaching out to me for questions or to connect, and I’ve been saying “no” frequently. Keeping my professional network strong in the long-run is important to me, so I may reach out to them in the future. Right now, it feels important to have separation. When there are extra things that come up at work or things that I could volunteer to do, I’m choosing to say no and not volunteer extra time because I am happy where I am in my career and I’m not shooting for a steep upward trajectory at this moment. When people pursue financial independence, they often communicate their reasons as wanting to have more time for people and things that are important to them and that bring them fulfillment. In my perspective, what is missing from Kasser’s perspective is the connection between time and money. 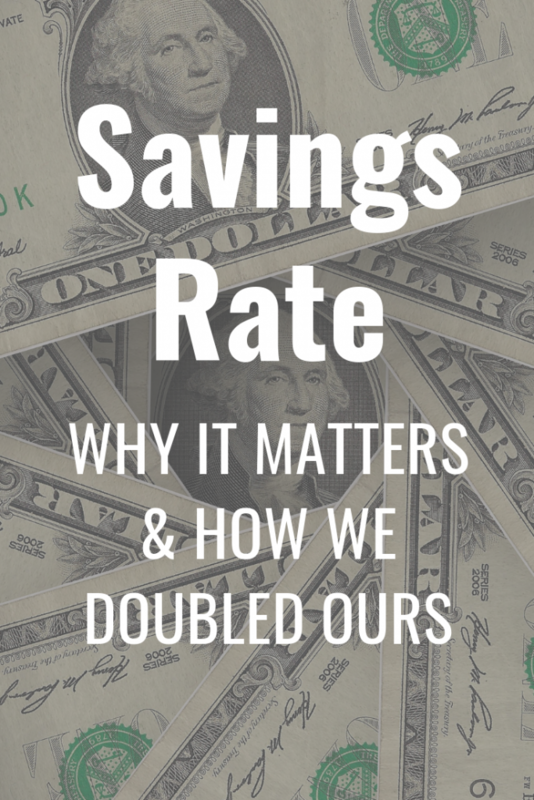 Having financial stability enables us to have more time affluence. If we have F-You Money or are financially independent, we are able to make more deliberate choices about the use of our time. We might feel more comfortable walking away from a job that isn’t serving us. We could choose to work fewer hours. We will likely have more confidence to say “no” to requests that we don’t want to do or that will take too much time. We can determine what our ideal lives look like and pursue our passions. Without having this financial stability, it can be more challenging (though certainly not impossible) to go against the grain of the dominant culture that says busyness is a virtue. With financial stability, we can pursue time affluence that enables us to pursue our Quadrant II and III goals. What steps have you taken to pursue time affluence in your life? YOU DON’T NEED TO BE BUSY TO BE WORTH SOMETHING. In fact, you’re worth a hell of a lot more when you aren’t so busy. Rachel – Thank you so much for sharing this! That is excellent advice, and I totally agree. At least it’s something I’ve been working on. I enjoyed this and I appreciate the quadrant exercise. Most of all I’m impressed at your willingness to acknowledge that some things you really enjoy/desire have to fall into the “low importance” category. Thank you so much for the comment. The quadrant exercise was inspired by all of the amazing folks on twitter over the weekend, so I’m glad you found it helpful. I sure did. I agree it’s a huge challenge to label things as low importance. Right now, my job is high importance, but as I approach FI, it’s possible that my job drops to the low importance category and blogging moves up to the high importance category. I’m still struggling with that a little bit though, because even though there aren’t short term ramifications if I don’t blog or travel, but I do think there would be long-term ramifications on my well-being and feeling like I’m living the life I want to be living. I wasn’t quite sure how to incorporate this into the model. If you have any ideas, I’d love to hear them. I started going down the business rabbit hole at work several years back. Work days would regularly become 10 hours and then I’d log on at night and weekends for more. Eventually I had to set boundaries or else I would have burned out by now. My new thing is I never check my work phone before bed. That used to cause me so much anxiety. Everyone who would need me has my personal cell and get ahold of me in a true emergency. I’m glad you were able to set boundaries. This was so well done! I loved all of the matrices to really visualize your ideas. The fact that people feel the need to be busy to feel relevant is certainly a problem in our society. Thanks for sharing such a thoughtful, and researched post. Very informative. Thanks for your comment. Busyness is a huge challenge I think. It’s the opposite of minimalism with our time! I’d love to hear a post on your views of minimalism in how we use our time! I loved this piece. I need to be more honest with myself about where I am in my life RIGHT NOW. It’s ok if things I’m not able to prioritize now become priorities late because I have a better financial situation and can prioritize time more. Thanks for sharing your thoughts. Thanks for the comment Diana. I totally agree that it’s okay for different things to be priorities in different seasons of our lives. We can’t prioritize everything, and we shouldn’t feel badly about that. I’m time affluent as hell. But almost too much. I know I don’t want to be crazily busy all the time, but I have a little too much downtime right now. It doesn’t help that I can run errands during the day (I work from home) and that I finish work at 3 anyway, so I can get all of my tasks done before other people have even gotten off work. It leaves a lot of time to fill. Meanwhile, I have chronic fatigue so volunteering isn’t necessarily an option. I generally only go out to things once or twice a week, and I reserve those for being with friends. So yeah, lots of downtime. I get a bit antsy without human interaction, which is a problem when you work from home. Anyway, I’m trying to read a bit more, which is helping. And I’m using some of the time to work more on the blog. That helps a bit. The rest is just an adjustment to living alone again after 12 years (10 of which the other person was home all day every day, so it’s quite an adjustment — a good one, but an adjustment). It certainly sounds like there are challenges with being too time affluent. I wonder if there are other hobbies that you could work on that wouldn’t cause too much fatigue. You have blogging which is great. Perhaps you could try photography or some other creative endeavor with your time. I also love reading, but I think there’s something about creative hobbies that are different for me. I wish you luck in figuring out your next steps, and I’m glad you have the time you need to take care of yourself as well. I’ve read a number of posts on busyness now. This is by far the most persuasive and well-thought blog post on the topic which I’ve come across. I can tell you’ve spent a lot of time on it and it has definitely paid off. Great stuff. In relation to busyness. I am still surprised at how many organisations still do not let their employees work from home even when the technology allows and the work itself is appropriate. Just think of the time that could be saved when we don’t have to commute, getting up extra early and prepare. The stress that it adds if you need to sort out young children and then rush to work. Not to mention the positive impact on the environment if you need to drive to work. All this saved time could be spent being more productive for the company, or for employees to have a better work/life balance which brings other benefits such as wellbeing, less time off sick and better retention because they are treated well. The idea that we need to be in the office to prove we are working is nonsense. Our worthiness should be measured on the quality of the output and whether we achieve the desired outcomes, not on how many hours we put in. Thank you for the feedback! I completely agree that people should be able to work from home more often. I actually work in HR though and really feel like being with colleagues in-person helps me to do build strong relationships with my colleagues and do my work better. I wouldn’t mind working from home one day/week though! For people in jobs that don’t require as much collaboration, I definitely agree that working from home more often should be encouraged! Quality of work should be more important than hours put in! I struggle with being too “busy” sometimes. Being a passionate person myself, I have a hard time not pursuing what I am working on 150%. I seem to pressure myself more than others do, which is a strength + weakness. Over the years I’ve gotten better at limiting the amount of time I work at my job. I try to keep it close to 40 hours per week these days. I’ve realized that my time is valuable and I will do what I can to make my work successful, but I’m not going to over stress about things I can’t control. You want to give me a project that has a short timeline? Great! I’ll do what I can to make it work, but I’m not going to “usually” overextend myself. I’ve also learned that when you do overextend your time, your employer can start expecting this to be the normal situation. Limiting the amount of time I am willing to work makes sure my employer has reasonable expectations on when I am willing to work. I find the above is much easier to do when you know your employer wants to keep you around. It’s harder to use this approach when you are new and still proving your value at your company. Thanks for sharing these tips. I definitely am my own worst critic, and used to pressure myself way more than others do. I agree that it’s both a strength and a weakness if taken too far. It sounds like you’ve been able to set very good boundaries in a work setting. While I agree that it’s easier to do this when you know your employer wants to keep you around, I think a lot of it depends on who you work with. I’m new to my job (2 months in), and I was able to set very clear expectations up front about what I would and wouldn’t do regarding work hours. When I was interviewing for jobs, I very clearly asked about this to multiple people in the interview process – asking people about times when they have brought up that they had too much work or were spending too much time to see what their response would be. And asking directly to my boss and others how they handle it when things like this come up. To be clear, I was interviewing for two jobs at the time. I asked similar questions there, and I didn’t get the job, because I wasn’t the right “culture fit.” They were pretty clear that it was because it seemed like I wasn’t going to put in the hours. I’m okay with that. When I was turned down for the job, all I felt was relief. In my new job, I still have moments where I think something needs to get done in a particular timeline and my boss is like, don’t worry we can push that off. 🙂 It’s a pretty amazing feeling. When I came in, they were expecting value; I didn’t have to prove anything, but I supposed I’ve lived up to the expectation so far. The culture seems really great compared to most places I’ve been. Great post, and good timing for me, as I am currently in a period of feeling too busy and overwhelmed and trying to figure out what to do about it. Have you ever read the book Scarcity? It’s about how not having enough of something (time, money) alters our thinking and behaviours…I think its discussions about time scarcity tie in well to your post. Thanks for your comment. I’m so glad this post resonated with you. I haven’t read the book Scarcity, but it’s going on my list. Great and thorough post! It really gives a framework for all the various things we do in life. Over many years of “running on the treadmill” I was starting to feel out of touch with societal changes, including modern movies, music, etc. After taking a few years off, I’ve had time to “catch my breath”, but I’m still not pushing myself to get those “important but non-essential” things done. That’s where I’m going to try to focus. Just last month, I finally got around to organizing about 10 to 15 years of digital photos from our various trips, etc. I don’t want things to ever “pile up” like that again. Thanks for taking the time to put this together. I’m sure it will help a lot of people. Thanks Jim! This was an insight for me too. I want to be focusing more of my time in important non-essential, but this requires me to get out of the grind and regular busyness of daily life.